micobike show you the way. Our guided tours are in small groups and in deverent levels. All our tours are individueal and we have a look to our clients. The destination, the distace and the level can be choose by our clients. We have a look, that the riders with very different levels ride on different tours, that everybody can enjoy the maximum as possible. The prices for the guided tour is in Euro, per Person and inclusive the bike. If you want towith us with you owen bike, no problem, ask us for the terms. micobike show you the autentic Mallorca, we give you a lot of informations of the island and the people, who live here. On each tour you do a stop to have a coffee or some food. 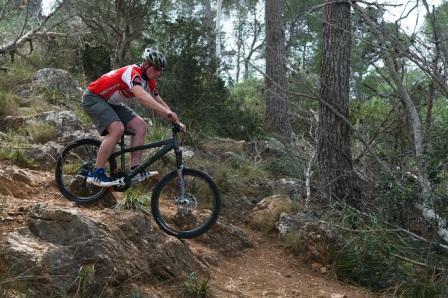 Exceptionally for mountainbiker and fans of singletrials will it recommend, to ride on with a guide, who know the places. With our driver trainings we offer you rider technique sessions, with all the baisics till difficult trail skills. We are available to answer any questions on our tours. If you prefer to explore the island on your own, we at micobike will help you plan the best route. During the transfer of the bikes to the required destination we will provide you with detailed maps of the area and will happily answer any questions.